The job search at https://stackoverflow.com/jobs doesn't appear to return all matching jobs. I think this might be a bug, but perhaps there is a good reason for it? This is not isolated to this job, I'm only seeing 40 jobs when location is set to the UK, but have seen a number of jobs in the UK on sidebar adverts that do not show in search results over the last 2 days. Careers allows employers to target job listings at particular geographic regions in order to minimise the number of applications that can't be acted upon (e.g. applicant doesn't have a visa, etc). This particular listing is targeted at the EU. If you don't have any locations specified in your job matching preferences we fallback to using your IP address to determine what jobs to show you. Our geoip database was out of date which was causing your IP address to be resolved to the US. And, to compound the problem, our ad server had a more up to date version which resolved you to the UK which was why you were shown the ad in the first place. I've just pushed the updated database to production, but you would be better served to specify your matching preferences in case you travel or connect via VPN when browsing the job board. Falling back to IP in those cases can result in weird behaviour! Search problem - are there really only two jobs within 100 km of Massachusetts? 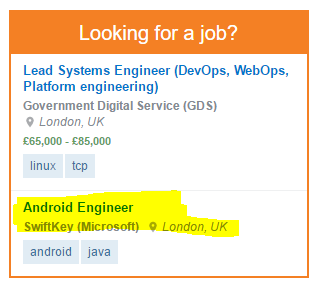 Why am I seeing jobs tagged with the wrong location?